A tiger beetle scans the forest floor for potential food. Tigers are among the largest and most ferocious of all predators. Renowned for their ability to subdue large prey, tigers sometimes develop a taste for humans and become man eaters. Last week, as I walked along a woodland trail, I discovered several six-spotted green tiger beetles hunting on the forest floor. As I watched their lethal power and speed, I was glad to be five-plus feet tall rather than five-plus millimeters in height! Tiger beetles have exceptionally long legs and are well adapted for hunting on the forest floor. Large eyes enable them to peruse their surrounds for signs of movement and potential meals. Unlike praying mantids that are “sit and wait” predators, tiger beetles actively stalk, pursue, and capture their victims. As I observed the tiger beetles hunting, I found that tossing a small twig in the vicinity of one often triggered an inquisitive charge as the beetle scrambled to see if a potential meal had entered its realm. The strange looking tiger beetle larva lives in an underground lair and captures unsuspecting prey that stray too near. 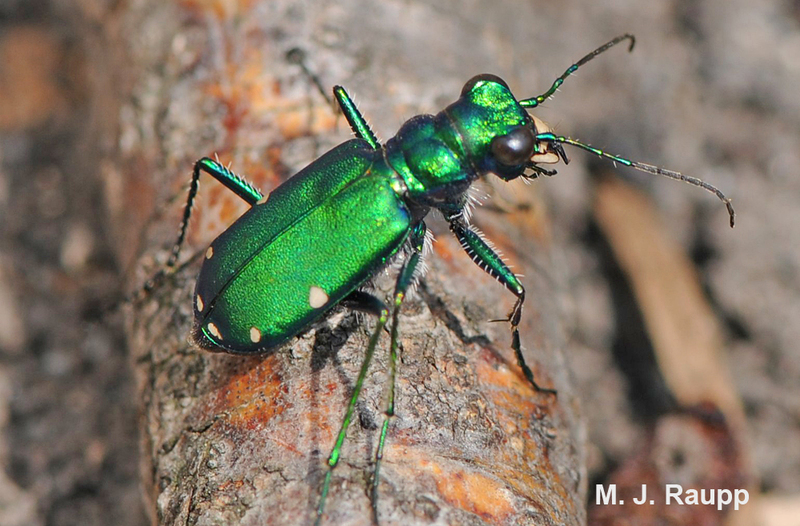 Like its feline namesake, the tiger beetle has powerful jaws used to subdue its victim. Each jaw is armed with several stout teeth. The jaws grasp, pierce, and crush the prey. Tiger beetles are carnivores as both adults and juveniles. The female tiger beetle lays her eggs singly on the ground. Upon hatching, the immature stage, called the larva, constructs an underground burrow. 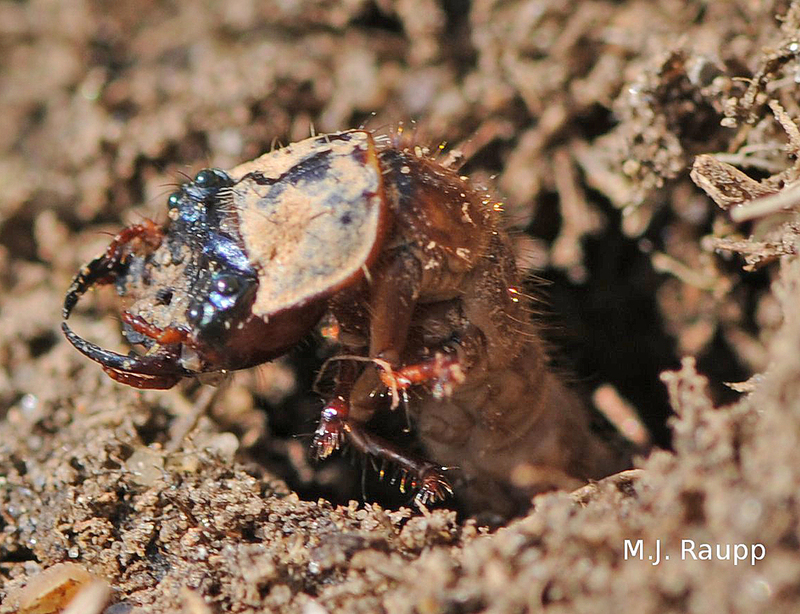 From this lair, the odd looking tiger beetle larva stealthily awaits its dinner. As a hapless insect or spider strolls by, the larva springs from the hole like a jack-in-the-box and impales its victim with impressive jaws. The prey is drawn into the burrow and eaten. Strange hook-like structures found on the abdomen of the tiger beetle larva help anchor it in its burrow. As you approach these hunters on the forest floor, stay low and move slowly. If you get too close, the green tiger will fly up and alight a short distance away. Often, after alighting, the tiger will turn and face its stalker. Tiger beetles are tough to capture without a net, but if you catch one, be careful; they have powerful jaws and can give you a little nip. This diminutive tiger will be common along sunny bike trails and paths in the forest over the next month or so. Six spotted green tiger beetles are another delight on a fine spring day, and the hope of spotting one well worth a walk in the forest. “An Introduction to the Study of Insects” by Borrer, De Long , and Tripplehorn was used a reference for this Bug of the Week.